Chris Brown and Karrueche Tran may have been living their separate lives but they still maintains the same circle of friends and associates. The “Grass Ain’t Greener” singer and the actress had an awkward encounter at Kylie Jenner’s birthday party at The Nice Guy in Los Angeles on Sunday night. Jenner was celebrating her 19th birthday on July 31st just like any other rich celebrity. There were a bunch of celebrities at the Party including Kim Kardashian, Kourtney Kardashian, Wiz Khalifa, Tyga, and others. Chris Brown showed up in his Lamborghini with Scott Disick. Kylie’s older sister Kendall Jenner was also at the party with her rumored boyfriend A$AP Rocky. The pair arrived together and left the party together early Monday morning. Karrueche arrived at the club with some of her female friends before Breezy. The two also left the party separately but on her way out paparazzi grilled Tran on what was it like hanging with her ex-boyfriend and the expression on her face says it all. Breezy on the other hand didn’t have anything to say about partying with his ex at the same place. Sources are also saying that the two didn’t have an exchange inside the venue, but Tran’s female friends were keeping tabs on Chris Brown to ensure that the two of them don’t cross path. Perhaps these two have finally buried the hatchet but still decided not to be friends. 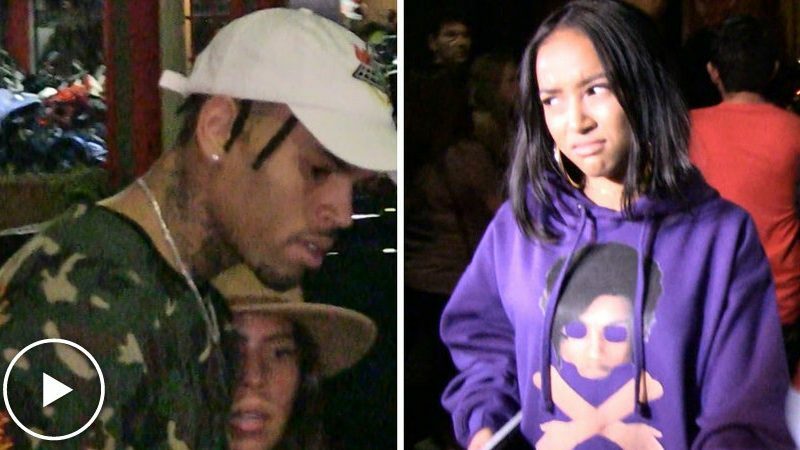 Karrueche Tran dumped Chris Brown about a year and a half ago due to his love child Royalty with former video model Nia Guzman. Things have been very between them ever since with both sides taking shots at the other on social media. That look is when she realize he ain’t want you no more.